This article is about a citrus fruit and plant. For other uses, see Yuzu (disambiguation). Yuzu (Citrus junos, from Japanese ユズ or 柚子) is a citrus fruit and plant in the family Rutaceae. It is called yuja (from Korean 유자) in Korean cuisine. Both Japanese yuzu and Korean yuja are cognates of the Chinese yòuzi (柚子), but the Mandarin word refers to the pomelo. Yuzu is called xiāngchéng (香橙) in Mandarin. Yuzu forms an upright shrub or small tree, which commonly has many large thorns. Leaves are notable for a large, leaf-like petiole, resembling those of the related kaffir lime and ichang papeda, and are heavily scented. Yuzu closely resembles sudachi (a Japanese citrus from Tokushima Prefecture, a yuzu-mandarin orange cross) in many regards, though unlike the sudachi, yuzu eventually ripen to an orange colour and there are subtle differences between the flavours of the fruit. Yuzu (left) comparing to mandarin orange (right). The yuzu originated and grows wild in central China and Tibet. It was introduced to Japan and Korea during the Tang Dynasty, and is still cultivated there. It grows slowly, generally requiring 10 years to fruit. To shorten duration to fruiting, it may be grafted with karatachi (P. trifoliata). It is unusual among citrus plants in being relatively frost-hardy, due to its cold-hardy C. ichangensis ancestry, and can be grown in regions with winters as low as -9 °C (15 °F) where more sensitive citrus would not thrive. In Japan, an ornamental version of yuzu called hana yuzu (花ゆず, 花柚子) “flower yuzu” is also grown for its flowers rather than its fruit. A sweet variety of yuzu known as the yuko, only present in Japan, became severely endangered during the 1970s and 1980s; a major attempt has been made to revive this varietal in southern Japan. 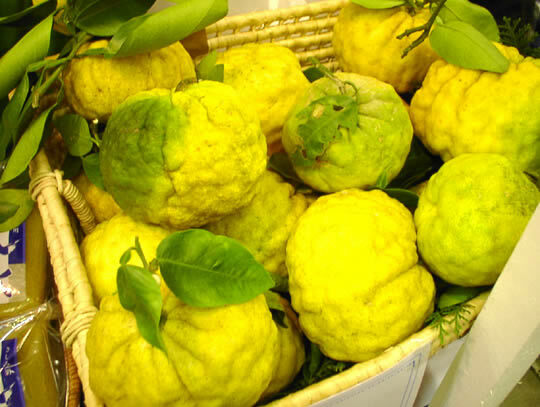 Another variety of yuzu in Japan, with knobby skin is called shishi yuzu (獅子柚子, literally “lion yuzu”). Dangyuja, a Korean citrus fruit from Jeju Island, is often considered a type of yuja due to its similar shape and flavour, but it is genetically a variety of pomelo. Though rarely eaten as a fruit, yuzu is a common ingredient in Japanese cuisine, where the aromatic zest (outer rind) as well as juice are used much in the same way that lemons are used in other cuisines. The yuzu’s flavor is tart and fragrant, closely resembling that of the grapefruit, with overtones of mandarin orange. 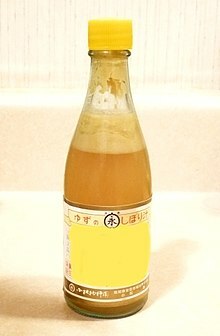 It is an integral ingredient (along with sudachi, daidai, and other similar citrus fruits) in the citrus-based sauce ponzu, and yuzu vinegar is also produced. Yuzu is often combined with honey to make yuzu hachimitsu (柚子蜂蜜)—a kind of syrup that is used to make yuzu tea (柚子茶), or as an ingredient in alcoholic drinks such as the yuzu sour (柚子サワー). Yuzu kosho (also yuzukosho, literally “yuzu and pepper”), is a spicy Japanese sauce made from green or yellow yuzu zest, green or red chili peppers, and salt. It is used to make liquor (such as yuzukomachi, 柚子小町) and wine. Slivered yuzu rind is used to garnish a savoury, salty egg-pudding dish called chawanmushi, as well as miso soup. It is often used along with sudachi and kabosu. In Korean cuisine, yuja is most commonly used to make yuja-cheong (yuja marmalade) and yuja tea. Yuja-cheong can be made by sugaring peeled, depulped, and thinly sliced yuja, and yuja-cha (yuja tea) can be made by mixing hot water with yuja-cheong. Yuja-hwachae (yuja punch), a variety of hwachae (fruit punch), is another common dessert made with yuja. Yuja is also a common ingredient in Korean-style western food, such as salads. Beginning in the early 21st century, yuzu has been increasingly used by chefs in the United States and other Western nations, achieving notice in a 2003 article in The New York Times. Yuzu is also known for its characteristically strong aroma, and the oil from its skin is marketed as a fragrance. In Japan, bathing with yuzu on Tōji, the winter solstice, is a custom that dates to at least the early 18th century. Whole yuzu fruits are floated in the hot water of the bath, sometimes enclosed in a cloth bag, releasing their aroma. The fruit may also be cut in half, allowing the citrus juice to mingle with the bathwater. The yuzu bath, known commonly as yuzuyu (柚子湯), but also as yuzuburo (柚子風呂), is said to guard against colds, treat the roughness of skin, warm the body, and relax the mind. ^ “Yuzu ichandrin (papeda hybrid). Citrus junos Sieb. ex Tanaka. Citrus ichangensis X C. reticulata var. austere“. Citrusvariety.ucr.edu. Retrieved 2012-11-17. ^ Kurokawa, Yoko (January 7, 2009). “The Yuko, a Native Japanese Citrus”. The Tokyo Foundation. ^ 5分. “柚子サワー | ホームクッキング【キッコーマン】”. Kikkoman.co.jp. Retrieved 2012-03-04. ^ Janet Fletcher (May 31, 2006). “Yuzu & Huckleberry, Flavors of the Moment: How these and other obscure ingredients end up on so many Bay Area menus”. SFGate / San Francisco Chronicle. ^ Phro, Preston (22 September 2015). “New citrus-yuzu-salt-flavored Jagariko potato sticks are delicious, cheap, and ultra-limited”. Sora News 24. Archived from the original on 19 February 2019. Retrieved 19 February 2019. ^ Loss, Laura (11 January 2017). “13 Ways You Can Enjoy Yuzu, Japan’s Favourite Citrus Fruit”. DigJapan!. Archived from the original on 19 February 2019. Retrieved 19 February 2019. ^ Morelli, Vivian (18 December 2017). “The Zesty World of Yuzu”. NHK World. Archived from the original on 19 February 2019. Retrieved 19 February 2019. Yuzu is also even used in the flavoring of many snack products, such as chips and chocolate bars. ^ “Bureau of Taste: Korean All-Purpose Yuzu Salad Dressing”. Sous Chef. 12 September 2014. Retrieved 5 January 2017. ^ Karp, David (December 3, 2003). “The Secrets Behind Many Chefs’ Not-So-Secret Ingredient”. The New York Times. p. 12. ^ Emi, Doi (December 21, 2017). “Soaking and Seasoning: The Aromatic Pleasures of “Yuzu““. Retrieved December 22, 2017. Yuzuyu dates from the Edo period (1603–1868) and may have been partially inspired by a form of Japanese wordplay called goroawase—the characters for “winter solstice” (冬至) and “hot-spring cure” (湯治) can both be read as tōji. ^ a b “Yuzuyu”. Nihon Kokugo Daijiten (in Japanese). Tokyo: Shogakukan. 2012. Archived from the original on August 25, 2007. Retrieved 2012-02-28. ^ “Yuzu”. Nihon Daihyakka Zensho (Nipponika) (in Japanese). Tokyo: Shogakukan. 2012. Archived from the original on August 25, 2007. Retrieved 2012-05-22. ^ “Yuzuyu”. Dijitaru daijisen (in Japanese). Tokyo: Shogakukan. 2012. Archived from the original on August 25, 2007. Retrieved 2012-05-22.